If you think the only place where you felt most yourself was when you were outside, foraging, surfing or simply just basking in the sun, then an outdoors funeral service might be for you. Woodland burial – also known as natural burial or green burial — is the environmentally friendly way to go out. On a farm, in a meadow or a field as part of an estate, you can be buried amongst local wildlife and contribute to it. Some grounds are privately owned or owned by charities, such as the National Trust. From farmland to estate property, there’s an increasing rise in natural burial sites. Or, if you’ve got a few acres knocking about, you could be buried on your own land. For the service itself, natural burial services are flexible affairs – you don’t need to stick to a traditional script. Hire a celebrant, conduct your own or do away with a service altogether. If you go for a woodland or natural burial, you’re going to be helping to protect the surrounding habitat for years to come. So, you’ll need a biodegradable coffin. Seagrass, bamboo, willow – no, this is not a recipe for your next juice cleanse. These are just some of the completely biodegradable materials that are now used to make coffins. From electric hearses to the brute force of some of your hardier mourners, make sure you arrive in something environmentally friendly. A bicycle hearse might be perfect. 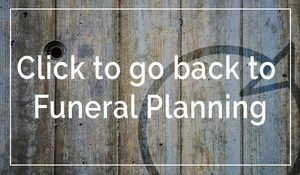 Your natural funeral doesn’t have to end at the burial. For the reception, why not stick to the great outdoors. Yurts, bell tents and country house barns are all ways you can be near to nature, without compromising on basic warmth and shelter. If you want to make a day of it, but would rather keep the cost down, encourage mourners to bring their own packed lunch. Use the funeral as an excuse to make others try out your homemade pie. After the burial, just make a picnic of it. If you would like to tick the eco-friendly boxes, go local. You could check out a local food directory. Scoring eco points doesn’t need to dampen a good time – shop around the microbrewery world to find local ales, too. While yurts are more fashionable, a sturdy marquee can do the job just as nicely. You’ll need some weights to hold it all down, but if they’ve made it this far, you’re loved ones are probably tough enough to withstand heavy winds. You’d rather not be buried? Take a look at alkaline hydrolysis. While being dissolved in an alkaline solution may be what you read in science fiction novels, this method simply uses a water solution rather than CO2 to dissolve the flesh, leaving only bone fragments.